Media Also 'Misspoke' On Blumenthal's War Record Connecticut Attorney General Richard Blumenthal was fighting for his political career Tuesday after The New York Times raised questions about whether he distorted his military service. But Blumenthal wasn't the only one who failed to present his record accurately. Several newspapers repeatedly mischaracterized his service. Tuesday was clearly a day of deep embarrassment for Connecticut Attorney General Richard Blumenthal, who was fighting for his political career after The New York Times raised questions about statements he made distorting the extent of his military service. But the episode is something of an embarrassment for the press corps, too. It turns out several news outlets have veered between accurately presenting his military record in the U.S. Marine Corps Reserve and reporting, unwarrantedly, that he served in Vietnam. 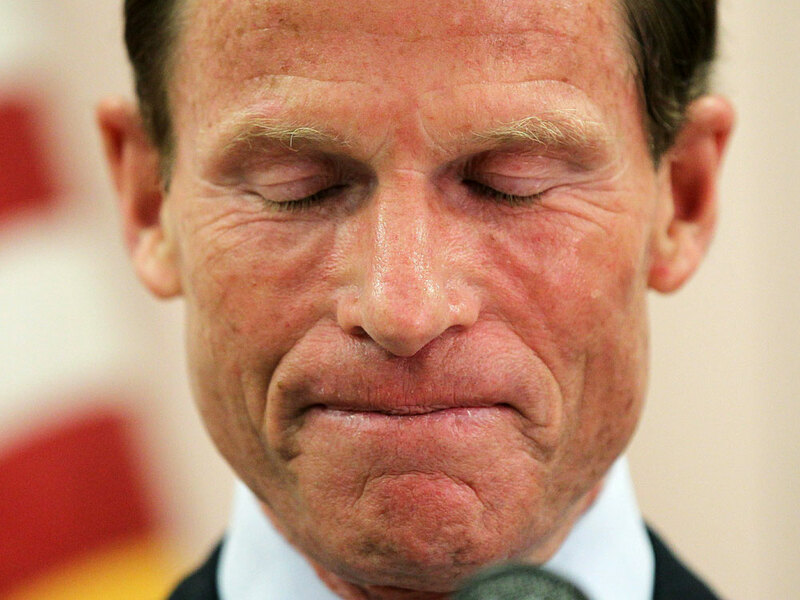 Connecticut Attorney General Richard Blumenthal, a candidate for U.S. Senate, said at a news conference Tuesday that he had "misspoken" on some occasions about his military record. Blumenthal never went to Vietnam. Yet the Times obtained videotape from March 2008 that showed him telling a crowd, "We have learned something important since the days that I served in Vietnam." The paper reported other instances that it said also showed him stretching the truth. Amid a threat to his bid to be Connecticut's Democratic candidate for U.S. Senate, Blumenthal apologized Tuesday afternoon and took responsibility for what he said were his misstatements on a relative few occasions. But he took on the media, too. "Sometimes journalists do make mistakes," Blumenthal told reporters who packed a press conference. "I'm responsible for my mistakes. I can't be held responsible for all the mistakes in all the articles -- thousands of them -- that are written about me." He's got a point. An extensive search of the news database Nexis conducted by NPR shows several Connecticut newspapers repeatedly mischaracterized Blumenthal's service, especially the Connecticut Post. There are not many serious treatments of Blumenthal's early life by the press. But in interviews for those that were written -- with, for example, The Washington Post and The Hartford Courant -- Blumenthal appears to have invariably spoken precisely and accurately about the nature of his military service. He has done the same in official resumes. In a debate during the Senate primary earlier this year, Blumenthal explicitly specified he had not served in Vietnam when referring to his stint in the Marine Reserve. Mark Pazniokas covered Blumenthal for more than 20 years and was the lead political writer for The Hartford Courant when he was laid off as part of massive cuts by the paper in early 2009. "Every time he talked about his military record, he was quite clear that he had been a military reservist and never came close to suggesting he was in Vietnam," says Pazniokas, now with the online Connecticut Mirror. The first news article misstating Blumenthal's military service appears to be from April 2003. The Connecticut Post, based in Bridgeport, called the attorney general "a former Marine sergeant who served in Vietnam." The paper used almost identical language in May 2008, in quoting Blumenthal saying, "When we returned from Vietnam, I remember the verbal and even physical abuse we encountered." In recent years, it referred to him several times as a veteran, even, on occasion, "a Vietnam veteran." Blumenthal, a former U.S. Marine, served as a reservist during the Vietnam War. Although he did not serve overseas, he said he knew many who did. "I saw how they were treated when they came home," he said. "Few received the respect they deserved." Similarly, in November 2009, the Connecticut Post called Blumenthal "a Marine sergeant during the Vietnam era." Reporters are paid to make distinctions -- such as the one between "Vietnam-era veteran" and "Vietnam War veteran." It's hard to understand why reporters would not check their own archives and either reconcile or explore the seeming contradictions. In most of those instances, was the mistake his or theirs? The New Haven Register also bounced back and forth. In November 2006, for instance, it reported, correctly, that "Blumenthal served as a sergeant in the Marine Corps Reserve." The following April, the Register wrote that the state's attorney general "served with the Marines in Vietnam." But as is now painfully clear, he didn't. "How much of this is some reporter who wasn't alive during Vietnam and didn't draw a distinction?" asked Pazniokas, the veteran Connecticut political reporter. "In the case of the videotape, I think we can all agree, it's all Richard. The rest of this, I don't know." Several reporters who wrote about Blumenthal, including Pazniokas, expressed surprise that he did not take the time to correct the record. They said he had an obligation to provide guidance on such biographical matters as his war record. Aaron Leo was one of the reporters for the Connecticut Post who wrote that Blumenthal served in Vietnam. Leo said he did not believe Blumenthal was seeking to mislead him. "He did not say to us specifically, 'I served in the war,' " Leo recalled. "But he did go to a couple of veterans' events and he seemed very close to the veterans who were present." "As journalism goes, sometimes distinctions are lost," said Leo, who was laid off last year by the Post and is now a freelance writer. "When you're trying to fit six speakers in a 12-inch story, you may select a word choice that doesn't convey what you mean." The online magazine Slate is correcting a passage in a profile from September 2000 that said Blumenthal "enlisted in the Marines rather than duck the Vietnam draft." According to the Times, Blumenthal obtained several deferments before entering the Marine Reserve. 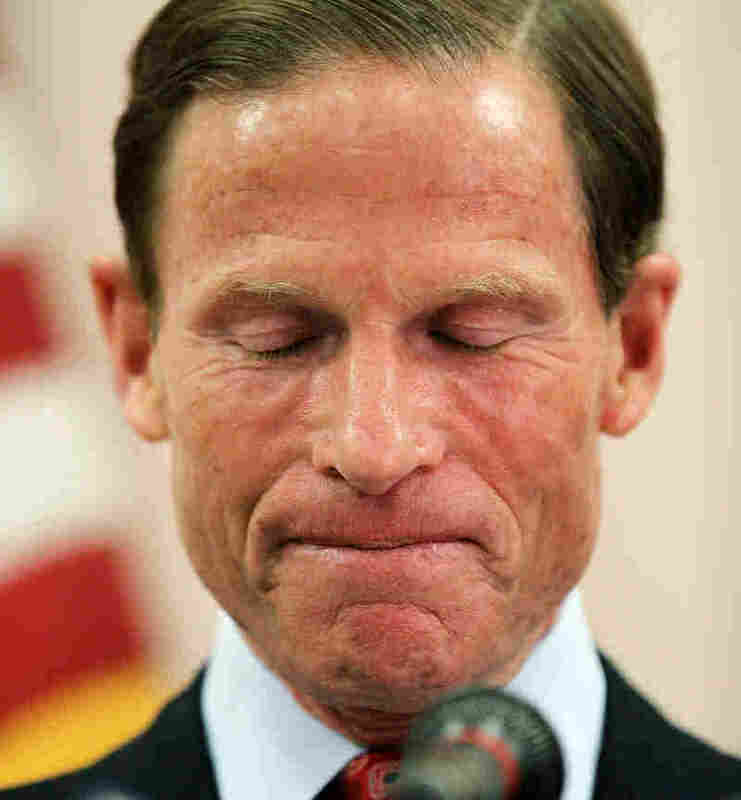 In two largely favorable profiles, the Slate article and a magazine article in The Hartford Courant in 2004 with which he cooperated, Mr. Blumenthal is described prominently as having served as captain of the swim team at Harvard. Records at the college show that he was never on the team. Commentators on Fox News Channel were among many who seized on that as a hint that the attorney general's behavior might be pathological. Yet David Plotz, the author of the Slate article, says he never spoke to Blumenthal. "It's definitely not from him telling me that he was captain of the swim team, nor his people," says Plotz, now the top editor of Slate. Plotz calls the correction embarrassing, but said he relied on previous media coverage. "This was a one-off piece. It's not primary source reporting." Elizabeth Hamilton, a former investigative reporter for The Hartford Courant, wrote the 14,400-word profile of Blumenthal in the paper's magazine in 2004 that mentioned his supposed stint as captain of Harvard's swim team. Like Pazniokas, Hamilton was laid off from the Courant last year. She says she no longer knows where she stored her tapes of her lengthy interviews with Blumenthal. Nor can she recall precisely how she checked that tidbit. Hamilton says she did read Plotz's profile in Slate and may have simply asked the politician to verify a few biographical elements from it. Plotz directed me to one earlier reference to Blumenthal's swimming days at Harvard: a 1994 gossip column in the Courant that interviewed him about his conversation with the late Jacqueline Kennedy Onassis. Again, there was no direct quote from Blumenthal about swimming and no mention of a captaincy, but an unusually specific characterization: "He swam the 100-yard and 200-yard freestyle at Harvard during a major rivalry between Harvard and Yale." Blumenthal told the Times that he was surprised by media mentions of his involvement on the swim team. The Courant gossip column's author, Patricia Seremet, died in 2006, so we can't check the origin of that sentence with her. It could have come directly from Blumenthal, a third party or from another article that did not show up on the databases. In this case, original reporting was often at a premium. "Every campaign is a triage," Pazniokas said. "The races that are intensely competitive get the most attention." Until Sen. Chris Dodd announced he would not seek re-election, Blumenthal had not faced a tough race in years. "These guys like Blumenthal, who are going to win with 65 percent of the vote, aren't going to get the same scrutiny," Pazniokas said. "I don't use that as an excuse for the media, but it's just a reality." As Pazniokas wryly points out, that may be more true than ever, given the deep cutbacks in the reporting ranks at news outlets like those serving Connecticut.